In a society where almost half the population uses ride-hailing services such as taxis, Uber, and Lyft, it’s shocking to consider passenger use of seatbelts, or lack thereof. People tend to be pretty good at buckling up when they’re in the front seat of a passenger vehicle. However, statistics show that people are less likely to use their seatbelts when seated in the rear. Recent research has shown that only 72% of passengers reported always wearing their seatbelt in the rear seat when in a personal vehicle, indicating that more than one-quarter of the population sometimes – or never – does. Seatbelt use decreases when passengers use a ride-hailing service, where only 57% of passengers reported always using their seatbelts while in the rear-seat. Of the passengers that reported not using seatbelts in the rear-seat in general, over 25% said they believed the rear seat was safer than the front and they didn’t feel the need to wear a seatbelt. The decrease in seatbelt usage when in a hired vehicle was associated with travelling short distances or at low speeds, both of which made passengers feel wearing a seatbelt was unnecessary. However, not wearing your seatbelt in a vehicle, whether personal or hired, increases the risk of injury for yourself and the other occupants – especially those who are belted and seated in front of an unrestrained passenger. When a vehicle is accelerated as the result of a collision, the rear-seat passengers tend to continue moving in their original direction of travel until they contact a component of the vehicle interior, such as the seatbelt, seatback, or centre console. The extent of a passenger’s motion is influenced by the severity of the collision, direction of the collision forces, restraint use, and intrusion of vehicle structures into the occupant compartment space. In a frontal collision, passengers will move forward relative to the vehicle interior. In an unrestrained scenario, this motion results in rear-seated passengers moving forward into the driver’s seatback and potentially into the front of the vehicle, at their initial travel speed, until they are slowed by interior contacts. 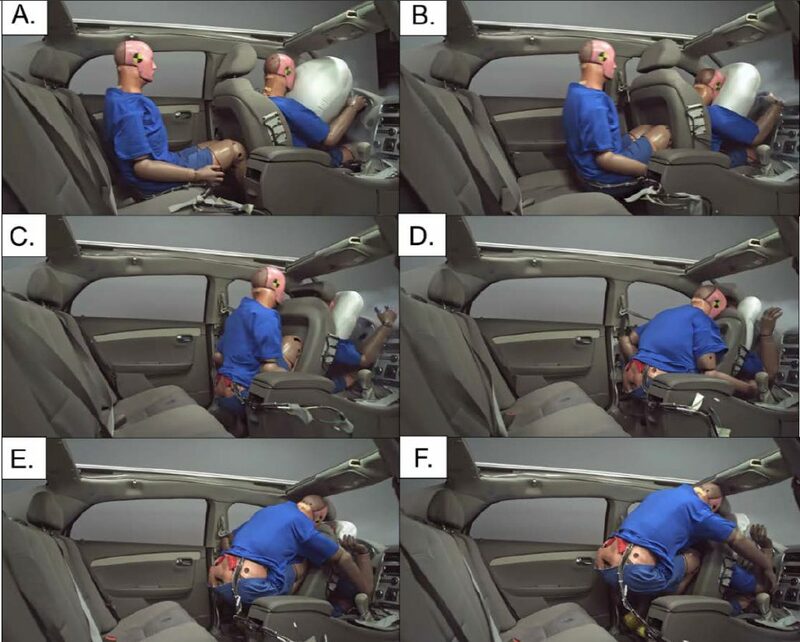 A recent crash test conducted by the Insurance Institute for Highway Safety (IIHS) provides insight into the motion of an unrestrained rear-seat passenger during a simulated frontal collision with a severity of approximately 56 km/h., During the initial stages of the collision, an unrestrained passenger will continue forward and upward into the driver’s seatback and headrest. The passenger’s knees may contact the seatback in the early stage of the collision and the passenger may continue forward and upward, striking their head and chest on the driver’s seatback and headrest. Figure 1: Time-lapsed imaged obtained from the onboard camera in the vehicle during the initial stages of the IIHS test conducted with an unbelted rear-seat passenger. The unrestrained rear-seat passenger acts as a projectile or ‘bullet’ within the vehicle. Their forward motion into the seatback in front of them can cause forward deformation of the seat, increasing the injury potential for the occupants seated in front. The odds of death for a belted driver seated directly in front of an unrestrained passenger in a serious head-on collision increase by more than two times when compared to similar crashes where they were seated in front of a restrained passenger. Similarly, the driver’s risk of severe injury was eight times greater with an unbelted rear passenger than with a belted passenger. The driver’s risk of severe injury was highest when their seat was deformed forward, which increased when there was an unbelted rear passenger. A recent decision in Stewart v. the Corporation of the Township of Douro-Dummer, addressed liability in a collision where occupants were unrestrained in a hired vehicle. The incident involved four passengers who had been out drinking and decided to go home by taking a taxi. On the drive home, the taxi was involved in a collision. One of the passengers injured in the collision was not wearing their seatbelt. The issue contested in this case was whether there was liability on the driver for the passenger’s failure to wear a seatbelt. Regardless of how you are getting around the city, by personal passenger vehicles or ride-hailing services, think twice before riding in the rear-seat without your seatbelt. Unrestrained occupants put themselves, and those in the vehicle with them, at risk. Jermakian, J.S., and Weast, R.A. (2018). Passenger use of and attitudes toward rear seat belts. Journal of Safety Research. 64: 113-119. Collision severity is quantified by the change in velocity, or ‘delta-v’, which is the difference between the pre-impact and post-impact velocity of a vehicle. For example, if a vehicle is stopped and struck from behind such that it is accelerated forward to a speed of 10 km/h, the collision severity would be 10 km/h. In the IIHS test, the vehicle was accelerated rearward up to a speed of 56 km/h to simulate a frontal collision. The delta-v is widely regarded as a good indicator of impact severity in collision reconstruction. Mayrose, J., Johler, D., Hayes, M., Tinnesz, D., Piazza, G., and Wilding, G.E. (2005). Influence of the Unbelted Rear-seat Passenger on Driver Mortality: “The Backseat Bullet”. Academic Emergency Medicine. 12:130-134. Parenteau, C.S. & Viano, D.C. (2017). Driver and front passenger injury in frontal crashes: Update on the effect of unbelted rear occupants. Traffic Injury Prevention. 19(1): 28-34.